New Sharon is a town in Franklin County, Maine, United States, incorporated in 1794. The population was 1,407 at the 2010 census. The town is roughly bisected by the Sandy River a tributary of the Kennebec River. Born in Harrisburg, Pennsylvania,  Longyear is best known for the Hugo- and Nebula Award–winning novella Enemy Mine , which was subsequently made into an identically titled movie and a novelization in collaboration with David Gerrold. The story tells of an encounter between a human and an alien soldier, whose races are in a state of war. They are marooned together in space and have to come to grips with the universal problem of facing and accepting xenophobia. A greatly expanded version of the original novella as well as two novels completing the trilogy, The Tomorrow Testament and The Last Enemy are gathered with additional materials into The Enemy Papers . 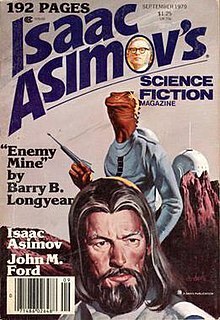 "Enemy Mine" is a science fiction novella by American writer Barry B. Longyear. It was originally published in the September 1979 issue of Isaac Asimov's Science Fiction Magazine. Later, it was collected by Longyear in the 1980 book Manifest Destiny. A longer, novel form was published, based on the film. It also appears in Longyear's anthology The Enemy Papers (1998): this version was labeled as "The Author's cut" and was significantly revised. The novella helped Longyear to win the John W. Campbell Award for Best New Writer in 1980. He was the only writer to win the Hugo, Nebula, and Campbell in the same year until this was matched by Rebecca Roanhorse in 2018. Rebecca Roanhorse is an Indigenous science fiction/fantasy writer from New Mexico. She has written short stories and science fiction novels featuring Native American characters. He also wrote the Circus World and Infinity Hold series, several stand-alone novels, numerous short stories, and two books for the Alien Nation novelisation series. His trilogy "Infinity Hold", "Kill All the Lawyers", and "Keep the Law", was released in 2002 in a single paperback volume titled Infinity Hold 3 by the Author's Guild in a Backinprint.com edition. His recent Jaggers & Shad mystery stories, featuring two detectives in the Artificial Beings Crimes Division (Devon Office) are set mostly in Exeter and the surrounding Devon countryside and villages. The first of the tales, The Good Kill won the Analog AnLab award for Best Novella in 2006 and Murder in Parliament Street won the same award for 2007. Alien Nation was a science fiction novel series, based on the movie and television series of the same name. It began in March 1993 with Pocket Books publishing the series. Various books of the series were written by L. A. Graf, Peter David, K. W. Jeter, Barry B. Longyear, David Spencer, Garfield Reeves-Stevens and Judith Reeves-Stevens. All of the books follow the adventures of the Human Detective Matthew Sikes, and his Tenctonese partner George Francisco. Like the TV series, most of the books have two parallel storylines that converge at the end, and most of the novels take modern day issues and put a slightly alien twist on them. The Circus World series chronicles the path taken by a space-going circus troupe whose spaceship crashes, marooning them on a deserted planet with no contact with the outside world. The Infinity Hold series addresses the question of what type of society would arise from a mob of violent convicts dumped on a new planet with no police or government. Saint Mary Blue is a novel about the course of treatment of a man who has substance abuse and mental health issues, while resident in a treatment facility. The God Box is a stand-alone fantasy novel where the unlikely protagonist finds himself the keeper of a small wooden box that provides cryptic guidance from the gods. He must stay ahead of a deadly manhunt and play his role in an ancient prophecy. The box, if asked, takes what he does not need and gives him what he does need but what he needs and what he thinks he needs are usually very different which lends itself to humorous and unexpected situations. Longyear has also written two mystery series, the Joe Torio mysteries (2011) and "Rope Paper Scissors" (2013). Sea of Glass is a dystopian science fiction novel by American writer Barry B. Longyear. Timothy Zahn is an American writer of science fiction and fantasy. He is known for the Thrawn series of Star Wars novels, and has published several other series of science fiction and fantasy novels, in addition to much short fiction. Walter Jon Williams is an American writer, primarily of science fiction. Previously he wrote nautical adventure fiction under the name Jon Williams, a series of historical novels set during the age of sail, Privateers and Gentlemen (1981–1984). John Kessel is an American author of science fiction and fantasy. He is a prolific short story writer, and the author of four solo novels, Good News From Outer Space (1989), Corrupting Dr. Nice (1997), The Moon and the Other (2017), and Pride and Prometheus (2008), and one novel, Freedom Beach (1985) in collaboration with his friend James Patrick Kelly. Kessel is married to author Therese Anne Fowler. 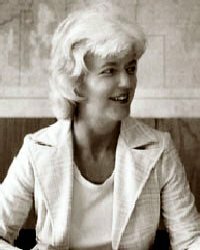 Martha Wells is an American writer of speculative fiction. She has published a number of fantasy novels, young adult novels, media tie-ins, short stories, and nonfiction essays on fantasy and science fiction subjects. Her novels have been translated into eight languages. Wells has won a Nebula Award, a Locus Award, and a Hugo Award. Susan Shwartz is an American author. Phyllis Eisenstein is an American author of science fiction and fantasy short stories and novels whose work has been nominated for both the Hugo Award and Nebula Award. She is an old friend of author George R. R. Martin and convinced him to include dragons in his international best-selling fantasy series A Song of Ice and Fire. Martin then dedicated the third novel in the series, A Storm of Swords, to Eisenstein. The 38th World Science Fiction Convention (Worldcon), also known as Noreascon Two, was held August 29–September 1, 1980, at the Sheraton-Boston Hotel and Hynes Civic Auditorium in Boston, Massachusetts, United States. The supporting organization was Massachusetts Convention Fandom, Inc.
Gilgamesh in the Outback is a science fiction novella by American writer Robert Silverberg, a sequel to his novel Gilgamesh the King as well as a story in the shared universe series Heroes in Hell. It won the Hugo Award for Best Novella in 1987 and was also nominated for the Nebula Award for Best Novella in 1986. Originally published in Asimov's Science Fiction, it was then printed in Rebels in Hell before being incorporated into Silverberg's novel To the Land of the Living. Real-life writers Robert E. Howard and H. P. Lovecraft feature as characters in the novella. Aliette de Bodard is a French-American speculative fiction writer. She is of French/Vietnamese descent, born in the US, and grew up in Paris. French is her mother-tongue, but she writes in English. A graduate of École Polytechnique, she works as a software engineer specialising in image processing and is a member of the Written in Blood writers group. The following is a list of works by science fiction and fantasy author Poul Anderson. 1 2 "Summary Bibliography: Barry B. Longyear". Internet Speculative Fiction Database . Retrieved February 13, 2016. 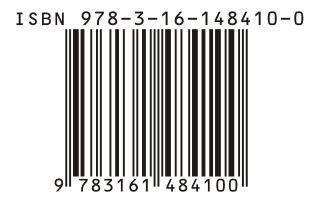 ↑ Amazon.com: Naked Came the Robot Paperback – 1 Nov 1988 Retrieved 2017-03-09.